Based on the EMT "Gold Plate" Analog 2-ch Reverb. This reverb can give your digital tracks more depth, more space and more soul. Don't let the easy to use interface fool you, this is a deep sounding reverb plugin that can stand up to any vintage hardware unit. Adjust the big Time knob to increase the length of the Reverb effect. Then you can dial in the tone of the Reverb effect by adjusting the Color knob. 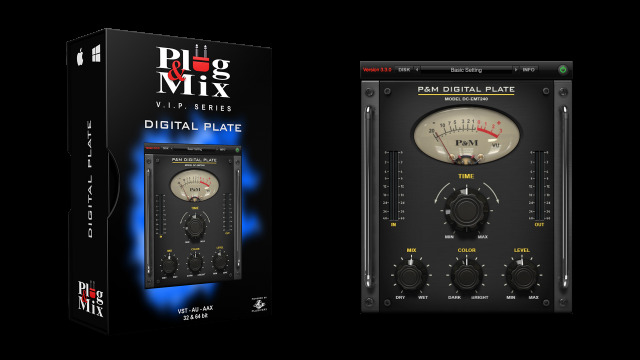 Finally, use the Mix and Level knobs to dial in your dry-to-wet mix and over all balance. - Time : Increases the time of the Reverb effect. - Color : Changes the tone of the reverb effect to be darker or brighter. - Level : Controls the output level of the plug-in.